“What’s special about Shishmaref is that we’re all family,” said Esau Sinnok, an 18-year-old climate activist from Shishmaref, a native village in western Alaska that might have to relocate because of climate change. “All 650 people there are my family and not being able to see them every day like I’m used to—if I had to move to the city—I’d be heartbroken and sad not seeing all of their faces," he said. Shishmaref is a barrier island about 130 miles north of Nome on the Chukchi Sea. Rising seas and more ice-free months are causing erosion that is eating away at the island. Residents fear it will be completely submerged within decades. Over a dozen homes have already been relocated, and sea walls 15-feet high have been built to protect others. Faced with the potential loss of their island, residents will vote on August 16 to decide whether or not to relocate to the mainland. The cost of moving, estimated at nearly $200 million, is a major hurdle for any effort to up and move. But residents worry just as much about the cultural cost of leaving the island and the seaside setting their lifestyle depends upon. In this Dec. 2006 photo, Nathan Weyiouanna's abandoned house at the west end of Shishmaref, Alaska, sits on the beach after sliding off during a fall storm in 2005. Sinnok has traveled around the world to advocate for his Inupiaq native village and others threatened by climate change in western Alaska. He became an Arctic Youth Ambassador for a program lead by the U.S. Interior and State Departments, and is currently a participant in the Sierra Club’s Fresh Tracks program. In December 2015, Sinnok attended the United Nations COP21 in Paris, France. At the conference, a global climate treaty was signed by 195 nations in an effort to prevent the worst effects of climate change. Sinnok’s village is on the front-lines of that change, and has already experienced dramatic impacts. “I remember my grandpa telling me that the ice used to freeze in October, and this past year it wasn’t safe enough to go out on the ice until late November or early December,” Sinnok said. “That puts a hold on our winter diet." Residents of Shishmaref depend on familiar weather in order to be able to hunt seals for meat and oil, fish for food, and gather traditional plants in the summer. But warming temperatures could make the lifestyle their people have lived for thousands of years unsustainable. “My family didn’t catch any ugruts (bearded seals) this year, so we didn’t have any ugruts to eat,” Sinnok said. Longer breaks in sea ice also means that ship traffic has increased in the area, leading to pollution, said Johnson Eningowuk, president of the Shishmaref City Council. The ship traffic through the Bering Strait—including fishermen, shipping, and even cruise ships— has impacted the marine wildlife and could be why there are fewer seals and fish around, Eningowuk said. “Without question our climate is dramatically warmer—we have a two month longer ice-free season which is causing region-wide erosion." The village’s other key source of food comes from gathering plants, a practice that's also being impacted by the drier, warmer temperatures. “We don’t get enough snow in the winter time and that really affects what grows on our mainland,” Eningowuk said. Western Alaska has seen dramatic, large-scale climate change impacts, according to Austin Ahmasuk, a marine advocate at Kawerak, an organization that advocates for Bering Strait communities like Shishmaref. “Without question our climate is dramatically warmer—we have a two month longer ice-free season which is causing region-wide erosion,” Ahmasuk said. It’s also causing marine life to move northward, including microbial species that lead to harmful algae blooms, Ahmasuk said. Davis Sockpick prepares freshly caught salmon on the beach along the Chukchi Sea on July 7, 2015 in Shishmaref, Alaska. In 2015, the Obama administration approved Shell Oil to begin drilling for oil in Arctic regions, including the Chukchi sea, worrying locals who live in the region and disappointing conservationists. Trees like willows and cottonwoods are moving north to colonize new areas, and Shishmaref—which has only ever had knee-high shrubbery—is now experiencing an explosion in willow. Overall, these changes have made Shishmaref residents’ subsistence lifestyle increasingly difficult to maintain, and some of the village’s youth have decided to leave for the cities, Eningowuk said. “Our culture is really hard, we’re up here near the Arctic circle, and we enjoy it—it’s what we’re used to,” Eningowuk said. “But our children, the younger generation are the ones who are not too excited about it,” he said, adding that all of his children have moved away from Shishmaref. “Other children are also already looking for other places to live…they’re finding other professions that will keep them in the cities,” Eningowuk said. The internet and television have shown them that there are easier ways to live, Eningowuk added. “It’s hard to stay alive here, to stay alive off of the ocean." “It’s hard to stay alive here, to stay alive off of the ocean,” Eningowuk said. Despite the challenges, Sinnok is determined to save his community and their way of life. He even plans to run for mayor of Shishmaref in time to lead the relocation to the mainland. “I want to run for mayor to find the available grants to relocate,” Sinnok said. 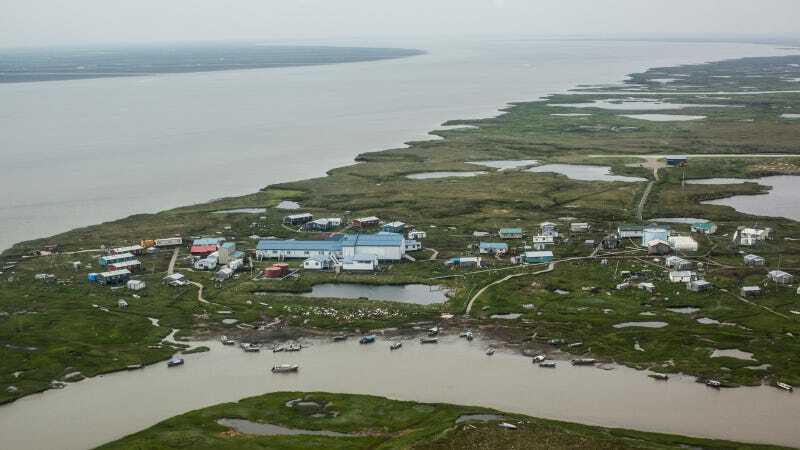 Nine villages, mostly in western Alaska, have been identified by the Army Corps of Engineers to be at imminent risk because of erosion and rising seas, according to the U.S. Department of Housing and Urban Development (HUD). All have been recommended to relocate. Between 200 and 300 villages will be at similar risk in the coming decades, according to the Corps. The native village of Newtok, 370 miles south of Shishmaref, is the first to have agreed to move to a new location. The move will be funded by state and federal funds, according to Maria Gonoa, a spokesperson for HUD. A complete overwash of Newtok is predicted to hit as early as next year, Gonoa added. As threatening as the climate impacts are, the cultural impact of leaving the village was also hard to think about, Eningowuk said. “At my age, I hope to not relocate from here,” Eningowuk said. Eningowuk said their lifestyle—dependent on the sea—would have to change if they went to the mainland. “That’s why we’re kind of reluctant to move,” he said. Ahmasuk said that Eningowuk’s reluctance is similar to many of the other affected villages in western Alaska. Ahmasuk said that even if Shishmaref residents vote to leave the island, they will have to find the money to fund the relocation. If they are unable to do so, they have to consider other options that include moving to a city like Nome where their close-knit community would likely grow distant over time. Sinnok hopes to avoid that possibility by continuing to advocate for his village and others in western Alaska threatened by climate change. He wants to help create a safe place for future generations to live together. “Back in 2007, my uncle and my dad and a few friends went out on the ice to go to the mainland to go duck and geese hunting. On the way back, my uncle fell through the ice,” Sinnok said. His uncle lost his life that day, and Sinnok said his death has been a driving force behind his activism for small villages. He wants the problems of the rural, small villages—not just the big cities—to get solutions to climate change and other pressing challenges so they can live safely and happily. Even if residents of Shishmaref are forced to relocate to the mainland, Sinnok says the community can survive as long as they stay together.